Genetic markers from the nuclear, chloroplast, and mitochondrial genomes were developed to distinguish unambiguously among four larch species [Larix laricina (Du Roi) K. Koch, Larix decidua (Mill. ), Larix kaempferi (Lamb.) Sarg., and Larix sibirica (Ledeb.)] used in intensive forestry in eastern North America. Nine random amplified polymorphic DNA (RAPD) fragments had good diagnostic value, and 3 out of 12 nuclear genes were found to harbor fixed interspecific polymorphisms implicating a total of 17 single nucleotide polymorphisms (SNPs) and 2 indels. The sequencing of five mtDNA introns (cox1-intron1, matR-intron1, nad1-intron b/c, nad3-intron1, and nad5-intron1) and four cpDNA regions (matK, trnL-intron, trnT–trnL and trnL–trnF intergenic spacers) resulted in the identification of 14 sites with fixed interspecific differences among the four species. Including the ten Larix species, one polymorphic site per 47 nucleotide sites sampled was observed for nuclear genes, one per 283 sites for cpDNA, and one per 374 sites for mtDNA. The phylogeny of the genus could be estimated from variation among the ten species detected in two cpDNA intergenic regions and four mtDNA introns. There was congruence between cpDNA and mtDNA phylogenies with three large groups delineated: the North American, North Eurasian, and South Asian taxa. The position of L. sibirica differed between organelle genomes. It was regrouped with South Asian species on the cpDNA tree, but with its North Eurasian congenerics on the mtDNA tree. To simplify the detection of diagnostic DNA sequence polymorphisms among the four main Larix species, cleaved amplified polymorphic sequence (CAPS) assays were developed from the polymorphisms identified in the various genomes. Seventeen primer–enzyme combinations were tested, and six were selected for their high level of informativeness. 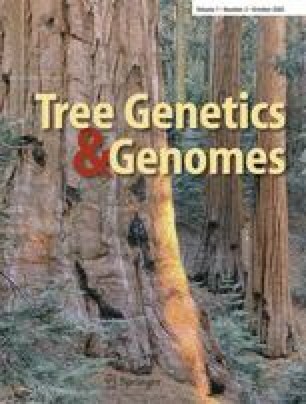 These new species-specific diagnostic markers should be useful for the certification of larch breeding materials and hybrid stocks used in intensive forestry in the northern hemisphere. We thank Gaston Lapointe and Martin Perron (MRNPQ), who provided materials from controlled crosses and foliage samples of parent trees collected in the province of Québec, and Owe Martinsson (Swedish Univ. of Agriculture, Umeå, Sweden) and Damase Khasa (Univ. Laval, Québec), who provided some seed lots. We are also grateful to Marie Bouillé, Claude Fortin, Sauphie Senneville, France Gagnon, and Manuel Lamothe for their assistance, as well as Patrick Meirmans and Patrice Dubois for reviewing earlier drafts of this manuscript. We also thank two anonymous reviewers for valuable comments on the manuscript. This research was funded by a grant from Fonds québécois pour la recherche sur la nature et les technologies (programme Actions concertées Fonds forestier) to J.B. and N.I., and a grant from the Canadian Regulatory System for Biotechnology to N.I.